(MP119). Ossie Jones (1947 -). Watercolour signed and dated 2007. Standard size: 11.8 x 8.5 ins (30 x 21.5 cms ) approx. 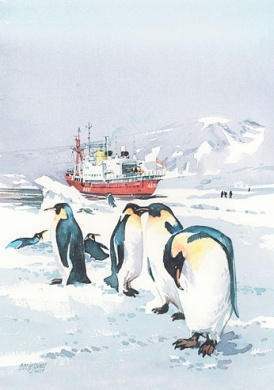 Five years before this painting of HMS ENDURANCE at South Georgia in 1982, a small task force led by HMS PHOEBE (Captain H M Balfour MVO RN) was sailed from UK in late autumn 1977 to mount a discreet presence off the Falklands Islands where a fresh territorial dispute with Argentina was coming to a head. That period of tension passed, but it was at tranquil South Georgia, 700 miles to the east of the Falklands, that trouble again flared in 1982. On 19th March a party of some 42 civilians’ was landed at Leith Harbour by an Argentinian transport to dismantle an old whaling station. The Argentinian flag was run up. The majority of the group was picked up the following week for return to the mainland, but a party of 12 and their flag remained. HMS ENDURANCE (Captain N J Barker RN), the Royal Navy’s Ice Patrol Ship, was sailed from Port Stanley in the Falklands on 20th March arriving at Grytviken where she kept the workmen under observation. Then, with intelligence now clearly indicating an imminent invasion of the Falklands themselves, ENDURANCE was ordered on 31 March to return to Port Stanley, before first landing a detachment of 22 Royal Marines to protect the British Antarctic Survey group and to maintain the watch on Leith. Meanwhile other Royal Naval forces around the world were being brought to heightened states of alert and nuclear powered Fleet submarines, Royal Fleet Auxiliaries and other supporting vessels were moved as required and in case a larger force was to be ordered south. On 2 April substantial Argentinian forces landed on the Falklands and captured the islands; similarly the small British force on South Georgia was overwhelmed. A day later parliament at Westminster agreed to the despatch of a naval task force: within 24 hours a Royal Maritime Auxiliary Service ocean-going tug had sailed from Portland to be followed over the next few days and weeks by some 44 warships, 22 RFAs and over 45 merchant ships Taken Up From Trade. The readying and despatch south of ever more RN, RM, Army, RAF and RMAS units proceeded against a rising crescendo of diplomatic initiatives which finally ended in failure. Meanwhile late April saw the recapture of South Georgia before much larger exchanges with Argentinian forces followed in early May. Later that month the main British landing was achieved on the Falklands and outlying islands with hard encounters in the air and at sea, and fierce battles ashore. There were gains and setbacks and the loss of lives; and always the weather - sometimes benign, often appalling  draped its ever complicating backdrop over the campaign. But British forces persevered through all the setbacks and difficulties and on 14th June Commander Land Forces Falkland Islands, Major General Jeremy Moore of the Royal Marines took the surrender. The Governor’s flag which had been struck 74 days earlier, was re-hoisted. And now, twenty five years after this epic feat of arms some 8,000 miles from our home shores, we remember with undying gratitude the 255 British Servicemen, Women and Falkland Islanders who gave their lives in the South Atlantic Campaign; and indeed all those of every nationality who were involved in the fighting and who lost their lives or were injured.